Dissolved  Into Adobe Systems, Inc.
What the web can be. Macromedia was an American graphics, multimedia and web development software company (1992–2005) headquartered in San Francisco, California that produced such products as Flash and Dreamweaver. Its rival, Adobe Systems, acquired Macromedia on December 3, 2005. Macromedia originated in the 1992 equal merger of Authorware Inc. (makers of Authorware) and MacroMind-Paracomp (makers of Macromind Director). Director, an interactive multimedia-authoring tool used to make presentations, animations, CD-ROMs and information kiosks, served as Macromedia's flagship product until the mid-1990s. Authorware was Macromedia’s principal product in the interactive learning market. As the Internet moved from a university research medium to a commercial network, Macromedia began investing aggressively to web-enable its existing tools and develop new native web only products like Dreamweaver. Macromedia created Shockwave, a Director-viewer plugin for web browsers. The first multimedia playback in Netscape’s browser was a Director plug-in. Macromedia licensed Sun's Java Programming Language in October 1995. In 1996, Macromedia purchased Future Wave Software and the product now known as Flash. By 2002 Macromedia produced more than 20 products and had 30 offices in 13 different countries. In January 1995, Macromedia acquired Altsys Corporation after Adobe Systems announced a merger with Altsys’ business partner, the Aldus Corporation. Altsys was the developer of the vector-drawing program FreeHand, which had been licensed by Aldus for marketing and sales. On account of the competition with the similar Adobe Illustrator, the Federal Trade Commission issued a complaint of Adobe Systems on October 18, 1994 ordering a divestiture of FreeHand back to Altsys. With Macromedia’s acquisition of Altsys, it received FreeHand thus expanding its product line of multimedia graphics software to include illustration and design graphics software. FreeHand's vector graphics rendering engine and other software components within the program would prove useful to Macromedia in the development of web products like Fireworks. Macromedia made two acquisitions in 1996. First, in March 1996, Macromedia acquired iBand Software, makers of the fledgling Backstage HTML authoring-tool and application-server. Macromedia developed a new HTML-authoring tool, Macromedia Dreamweaver, around portions of the Backstage codebase and released the first version in 1997. At the time, most professional web authors preferred to code HTML by hand using text editors because they wanted full control over the source. Dreamweaver addressed this with its "Roundtrip HTML" feature, which attempted to preserve the fidelity of hand-edited source code during visual edits, allowing users to work back and forth between visual and code editing. Over the next few years Dreamweaver became widely adopted among professional web authors, though many still preferred to hand-code, and Microsoft FrontPage remained a strong competitor among amateur and business users. Macromedia acquired FutureWave Software, in November, 1996, makers of FutureSplash Animator, an animation tool which FutureWave Software had originally developed for pen-based computing devices. Because of the small size of the FutureSplash viewer application, it was particularly suited for download over the Web, where most users, at the time, had low-bandwidth connections. Macromedia renamed Splash to Macromedia Flash, and following the lead of Netscape, distributed the Flash Player as a free browser plugin in order to quickly gain market share. As of 2005, more computers worldwide had the Flash Player installed than any other Web media format, including Java, QuickTime, RealNetworks and Windows Media Player. As Flash matured, Macromedia's focus shifted from marketing it as a graphics and media tool to promoting it as a Web application platform, adding scripting and data access capabilities to the player while attempting to retain its small footprint. Macromedia continued on the merger and acquisition trail: in December 1999, it acquired traffic analysis software company Andromedia Corporation. Web development company Allaire was acquired in 2001 and Macromedia added several popular server and Web developments tools to its portfolio, including ColdFusion, a web application server based on the CFML language, JRun, a Java EE application server, and HomeSite, an HTML code editor that was also bundled with Dreamweaver. In 2003, Macromedia acquired the web conferencing company Presedia and continued to develop and enhance their Flash-based online collaboration and presentation product offering under the brand Breeze. Later that year, Macromedia also acquired help authoring software company eHelp Corporation, whose products included RoboHelp & RoboDemo (Now Adobe Captivate). ^ "Adobe to acquire Macromedia". Retrieved 2005-04-18. ^ a b "Macromedia Company History". Retrieved 2011-02-17. ^ . "Federal Trade Commission Decisions, Complaint 118 F.," (PDF). Retrieved 2011-02-11. ^ "Flash Player in 2005". ^ "Investors sue Macromedia again". cNet. 1997-09-04. Retrieved 2011-02-17. ^ "Macromedia shareholder suits dismissed 05-19-98". Marketwatch, The Wall Street Journal. 1998-05-19. ^ "Adobe, Macromedia reach agreement in Patent lawsuit". PCMag. 2002-05-06. ^ "Adobe Wins User Interface Suit Against Macromedia". PCMag.com. 2002-07-29. ^ "Macromedia wins $4.9m in Adobe patent suit". PCWorld. 2002-05-13. ^ "Adobe, Macromedia reach agreement in Patent lawsuit". PCWorld. 2002-07-29. ^ "Adobe and Macromedia settle patent lawsuits". Pinsent Masons. 2002-07-30. ^ "Bud Colligan". NNDB. Retrieved 2011-02-17. ^ "Bud Colligan". CrunchBase. Retrieved 2011-02-17. ^ "Robert K. Burgess". NNDB. Retrieved 2011-02-17. ^ "Profile, Robert K. Burgess". Forbes. Retrieved 2011-02-17. ^ "Macromedia Names Stephen Elop Chief Executive Office; Rob Burgess Continues As Chairman". Macromedia. January 19, 2005. Retrieved 2011-02-17. ^ "Macromedia Names Stephen Elop as Chief Operating Officer; Core Leadership Team Broadens with New Marketing and Sales Executives.". Goliath Business Knowledge. July 28, 2004. Retrieved 2011-02-17. ^ "How will Stephen Elop fare at Microsoft?". ComputerWorld. January 11, 2008. Retrieved 2011-02-17. 1992: Bud Colligan became co-founder and CEO of Macromedia, a position he held until 1997; he served as Board Chairman 1992-1998. 1994: Altsys Corp and CEO James Von Ehr became a Macromedia vice-president, a position he held until 1997. 1996: Robert K. Burgess was hired as President of Macromedia, and became CEO in 1997, a position he held until 2005; he served as Board Chairman 1998-2005, a position he held when the company was acquired by Adobe. 1997: Betsey Nelson became Chief Financial Officer, a position she held until Macromedia was acquired by Adobe. 2004: Stephen Elop became Chief Operating Officer. 2005: Stephen Elop had been CEO for three months when Macromedia announced it would be acquired by Adobe. On August 10, 2000, Adobe System Incorporated claimed that the San Francisco-based Macromedia violated two of its patents on tabbed palettes. 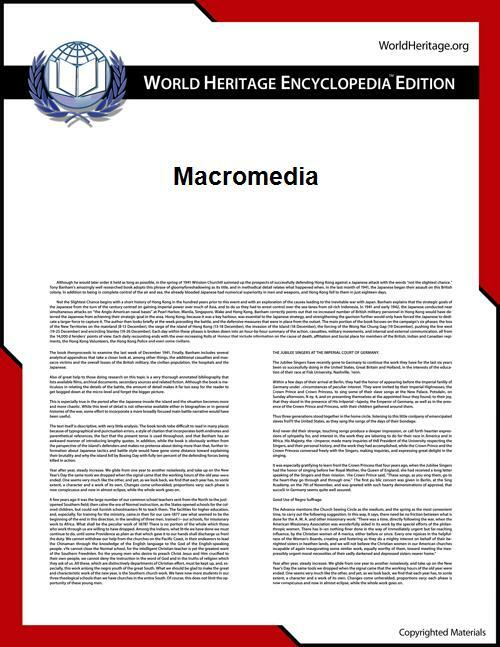 Macromedia countered with a claim that Adobe infringed on Macromedia's patents for a draw-based editor for Web pages and a hierarchical structure editor for Web sites. In July 2002, Adobe and Macromedia reached an agreement that settled all claims in this series of patent suits. On August 22, 1997, stockholders filed a class-action lawsuit in the California Superior Court in San Francisco, accusing Macromedia of misleading stockholders on the company's product success and financial health. A similar suit had been filed in July. The class-action suit was dismissed by a federal judge on May 19, 1998.